1-1/2 in. 304 STAINLESS STEEL HAND DRIVE 4D SHINGLE / SHAKE NAILS, RING SHANK, 14 GA x 7/32 in. HEAD. MADE IN USA. BULK PACK, 1-LB (about 394 nails). PRICE/LB. 1-1/2 in. Stainless Shingle 4D Nails, Ring Shank, Hand Drive, 5 Lb. 1-1/2 x 0.093 in. 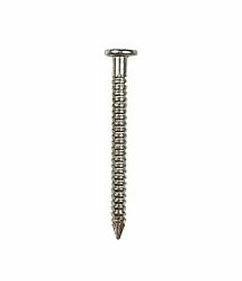 304 Stainless Steel Nails, Ring, Hand Drive, 1 Lb. 1-1/2 x 0.093 in. 304 Stainless Steel Nails, Ring, Hand Drive, 25 Lb. 1-1/4 in. Stainless Shingle Nails, Ring Shank, Hand Drive, 5 Lb. 1-3/4 316-Stainless Roofing / Siding Nails, Ring Shank, Bulk, 5-Lb. 1-3/4 Stainless Shingle 5D Nails, Ring Shank, Hand Drive, 5 Lb. 1-3/4 x 0.093 in. 304 Stainless Steel Nails, Ring, Hand Drive, 1 Lb. 1-3/4 x 0.093 in. 304 Stainless Steel Nails, Ring, Hand Drive, 25 Lb. 2 in. 316-Stainless Roofing / Siding Nails, Ring Shank, Bulk, 5-Lb.